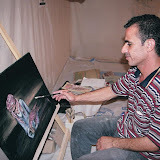 Thaer Shafiq Ali Abdallah is an artist/ human rights activist and Palestinian refugee from Iraq. He was born and grew up in Baghdad. In 2005 he began documenting and publicizing the torture and detention of Palestinian refugees in Iraq. He met with UNAMI officials and shared testimonies of detained and threatened Palestinians. 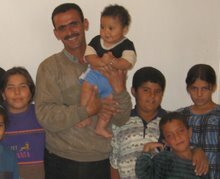 In October 2005 he led a group of refugee families who fled Iraq and were eventually accepted into Syria, in a UNHCR refugee camp in Al Hol. Only 300 Palestinians from Iraq have been allowed into Syria. All borders are now closed to Palestinians from Iraq. In 2006 Thaer and his American fiancee submitted a U.S. fiance visa application for him. Thaer also had a refugee application to Canada, which has since been cancelled. 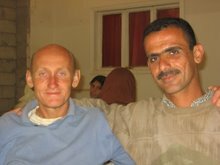 On 22 December 2006, Thaer was detained by Syrian security forces. Thaer was held at the "Far' Filistin," the Palestine Branch Military Intelligence facility in Damascus. He was kept in a small cell, fed very little, and tortured both physically and psychologically. Torture included simulated drowning, beatings, and solitary confinement. His interrogators accused him of working for Americans. They would not believe that he was merely engaged to an American. On 10 February 2007, Thaer was deported to the Iraq border. Thaer had received death threats in Iraq because of his documentation of detentions and torture by Iraqi security forces and militias. 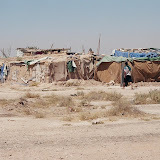 Thaer went into hiding in the Al Tanf camp in no-man's-land between Iraq and Syria. 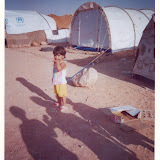 The Canadian Embassy and UNHCR tried to gain access to him in this camp, to no avail. The U.S. Embassy did not seek access to Thaer. On 10 March 2007, Thaer was discovered in the no-man's-land area and was again detained by Syrian security forces. He was taken again to "Far Filistin," notorious for torture. 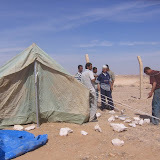 The Canadian Embassy and UNHCR tried to help him but received no access. On 6 April 2007, Thaer was deported back to Iraq. He settled at the Al Waleed refugee camp, with more than 1,100 other Palestinian refugees who have fled threats of torture and death in Baghdad. After being deported to the desolate, overcrowded Al Waleed camp, Thaer made the most of his gifts. 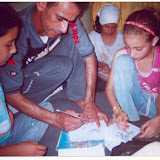 He started art classes for the children in the camp. 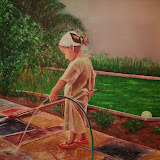 "Drawing helps them to express what is inside them," he says of the children. See the PHOTO ALBUMS for pictures of him and his students. Although Thaer and his American fiancee had almost completed his visa application, Thaer had no access to U.S. immigration while he was in Iraq. U.S. policy requires visa applicants from Iraq to leave Iraq and apply at embassies outside. But Palestinians in Iraq have no travel documents and cannot legally leave! Thaer was trapped in Iraq. SO CLOSE TO FREEDOM -- In October 2007, Thaer managed to reach Greece as a "boat person" with 22 other refugees. He applied for refugee asylum so that he will have legal status while re-starting the fiance visa process. We hope for the best. 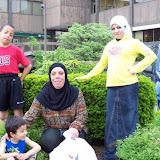 AT LAST: On April 13, 2008, Thaer arrived in the U.S. He and Sheila married on April 21, 2008 and are building a new life in the Boston area.